i would think as thin as possible as its not going to get much flexing and will be attached to the roof probably. i guess if not attached to the roof and just supported from the ends it could sag with time, not sure how resistant the fiberglass is when really thin to sagging with time. the components in the middle are pretty light ones, its the caps that are the most dense along with the rectifier and voltage regulator. at the one end. OK, so maybe 0.6mm. They allow 0.4mm but the EM13 boards are pretty thin as is (and stiff). so, I will do 0.8mm as the engineering fee goes up a lot for 0.6mm for this board (at least the version I posted a couple nights ago). We'll see once I upload the final board. One question for the team: What thickness of board should we use? The Ersatz-EM13 decoder is 0.6mm. It is not bad but I thought maybe 0.8mm? (Traditional boards in electronics seem to be about 1.6mm or so based on what I see to buy online for test boards). They don't really need to have any strength. And thinner is easier to break to shorten. I'd vote for thinner. TORMs are 0.8mm and they're super easy to break with a minimum of scoring. I'll probably get 100 made as a sample run (since the price between 10 and 100 is like $20 delivered or something -- 10 pieces is like $2.60 each and 100 samples are like 40 - 50 cents each, delivered). So those who want to get some to play with can just cover whatever the cost is for me to get them plus postage to your place. Once we like them we can do bigger runs (they will get used up fast since most trains are like 4 - 6 - 8 -10 or so cars or more and we all have arge fleets 🙂 and 1000 is like 25-30 cents each IIRC ). Count me in. Just PM me with a number and I'll paypal it to you. I feel like I would like to support this work, but I'm nowhere near ready to assemble my own components on a circuit board. IN what way "not ready"? Not to that part of your layout needs? Not handy with a solder iron? 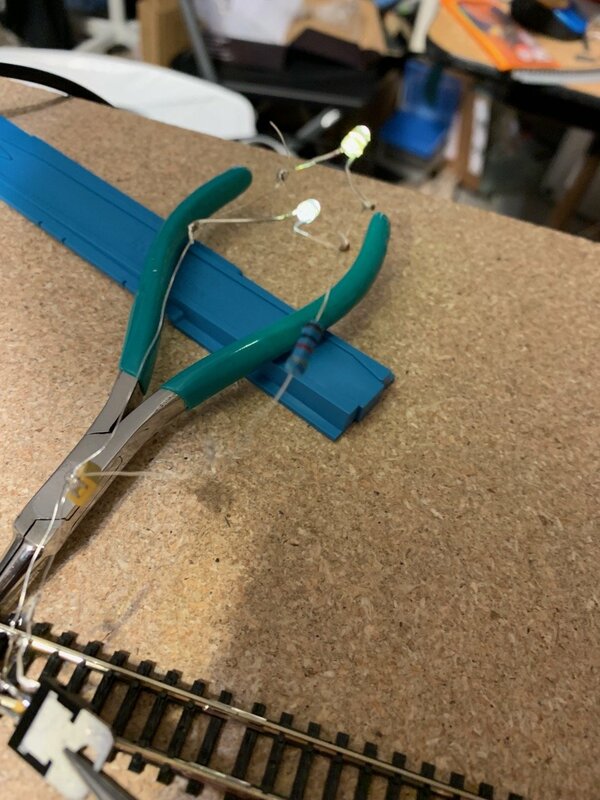 While LEDs in parallel off a single resistor are not the ideal arrangement (they will start burning out at some point as one will have a slightly lower internal resistance and draw more current), this should work fine assuming you use all the same type of LEDs. have you breadboarded this all to verify it all works as laid out? Mainly concerned about the voltage reg caps are all happy as is. Know you got them off the spec sheets but always good to verify. Breadboard pcb is great to solder up a Frankenstein to test on something like this with small bits of wrapping wire soldered in and resistor leads for busses. if I get a little time over the weekend I can try to do one, but I’m not sure I have things close to the buffer caps or not. Sadly parts are strewn across many boxes trying to get things more organized and these are the tiniest of bits! I think I had a small smd ceramic cap series set, but have to see if I can find them and there are ones close. Actually in this case it won’t burn out as it’s only a couple of ma in total to the leds, but if one does start to draw more the it will light brighter (but still way below limit) and the rest not light. I seem to remeber reading a while back that it was at higher current that the differences in draw would show up more — and of course potentially fry the one higher current led as total ma are over the led of a single led and then perhaps all of them down the line. I think it was at the low end as it was against the desired pump as many ma as possible in this discussion. the other thing I remeber is that I think the forward voltage goes down with lower current, so the 3.3v voltage regulator should work and thus let you use lower voltage caps. I think that was part of the dcc stuff don was working on with trainaidsa. They wanted a simple lighting/end car decoder and starter power pack. I think do was surprised how cheap the circuit was, like you said mainly programming. Not yet. 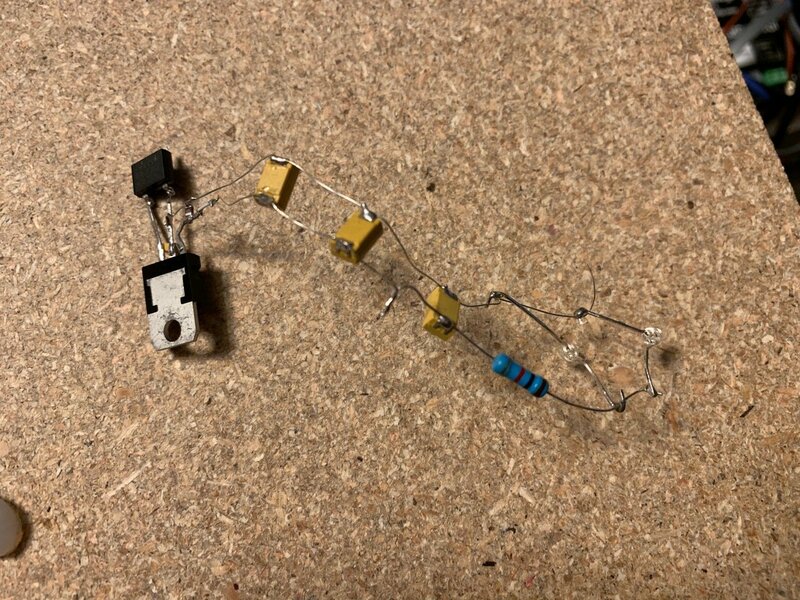 I don't have any actual breadboard pr anything but do have a spool of "buss 30" wire and was planning on soldering together the circuit using example values to test this weekend. 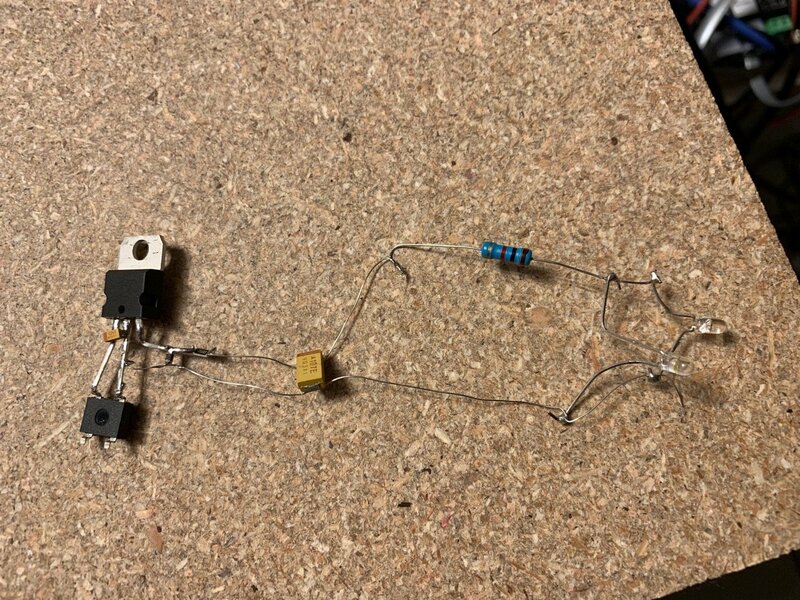 The usable parts/values in this circuit are legion, meaning many different combinations. So there is no one circuit to test and verify. I am more interested in testing the circuit path. but European brand cars don't have any pickup at all, and the power pickup system in them is pretty terrible anyway. Have you ever tried one of the "wheel wiper" pickup lighting kits? If so are they problematic? Perhaps the capacitors could help. I'm interested in lighting my European coaches. I wired up the circuit (using 2 bulb LEDs and a single 100uF Tantalum cap [tested up to 3 of the 100 uF] instead of a row of smaller value ceramic caps as it was easier to solder). The rectifier bridge is a larger model (about same spec -- just physically larger) that I had bought a small number to test with the LED strip lights but functionally it is the same as the MB6F/S ones. The voltage regulator was a 5V one L7805CV with 3 legs (not SMD). The board is set to take this one or 2 different smd regulator packages. I used a 0.22uF tantulum on the input to the voltage regulator instead of the 0.33uF ceramic as I had some I ordered by accident and it shouldn't really matter I don't think in our simple circuit. I used a 0.1uF ceramic on the output and a 75 ohm (instead of 100 ohm as I had a bunch) resistor into the 100UF tantulum. After the 100uF tantalum I used a 1K ohm "dimmer" resistor since we are not at 12V but rather 5 and then I put 2 bulb LEDs I had taken off of KATO lightboards when doing DCC conversions. What's the purpose of the little cap and the resistor before the big cap? Also how do you connect the voltage regulator? What's the wiring logic? The wiring logic is in the schematic I had posted earlier (ignore the values posted as they were representative). What do you mean exactly "how do you connect the voltage regulator)? The data sheet for the voltage regulator specifies a cap on the input and another on the output to "stabilize" the voltage. The values can vary but several of the voltage regulators say using about a 0.33uF on the input and a 0.1uF on the output is enough. For my test I used a 0.22uF on the input as I had a bunch here. The small resister before the caps is to limit inrush current. A smaller value may be better. I am going to try 25ohm in my test circuit tomorrow. Cool, glad it worked. Might be best to mock up with the current across 5 or 6 smd leds as it’s like the final. Also the smd glow is a bit different than the epoxy bulb guys. I would looks at the reflected glow off a white sheet of paper rather than looking at the naked intense glow of the smd leds as they are so point source intense they will make our eyes react. Reflected will be how it’s seen in the cars and may give a better idea of how the glow drops off.you can also try just dropping the connection for a short bit to see if you notice the break. Also a circuit without the storage caps to see how it’s different. The actual circuit can have up to 14 LEDs if you use the full length. (Based on some commercial ones that have more closer together for more even coberage). Since they are in parallel I am not sure I need to mock up the complete set of LEDs. I can add a few more in though. Once I get the sample boards we can play around with actual values for things. Easier to take a board and solder stuff on to it then mess around with the wires, which are a PITA with the smd stuff (I realize the smd stuff is not meant for attaching to wires but it is what I have). Here is an updated PCB layout. I added in spots for 3 more capacitors and removed a double wire I discovered (two spots connected by two traces instead of one). I also switched the SOT-223 regulator pins around since I found a cheap voltage regulator in 3.3V and 5V versions in the SOT-223 package so I switched the pins to match (and I may have screwed it up originally when I planned the SOT-223 regulator pads anyway). The current is shared by all the leds so the resulting brightness will be basically related to the current supplied. The the length of time the leds remain lit will be proportional to the capacitance of the capacitor(s) to store charge. Fewer leds will glow brighter with the same current and dissipate about the same, but I think it’s more on the perceived dimming that may be seen to the eye in a flicker situation. I. The end is just trying to trick the eye that there is no flicker. I suspect that playing with different component values is what we need to do to worry about flicker and tricking the eye. The basic circuit path would not change. Yes, I was just thinking on this as you responded! You are spot on the circuit looks to work and the perception of flicker can then be tested with number of leds and capacitance I the circuit! might hook it to 12v and leave it on for a few days to torture test. What do you mean exactly "how do you connect the voltage regulator)? Yes. That's all I meant. The schematic answers the question. Thanks.